Evolution Motorsports Stainless Steel Brake Lines - Dezod Motorsports Inc - Home of the automotive performance enthusiast since 2002. Evolution Motorsports Stainless Steel Brake Lines are a must for those looking to achieve more performance out of their braking system. 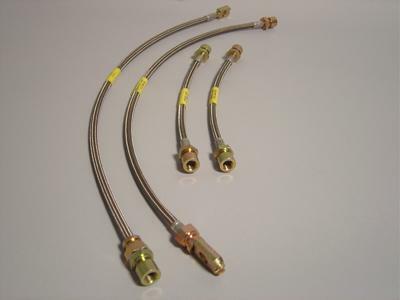 OEM brake lines are made out of a rubber compound that will expand upon hard braking. The Evolution Motorsports Stainless Steel Brake Lines will not flex or expand, which will increase braking performance. These lines are standard on any Evolution Motorsports Big Brake Packages, but they will be beneficial on stock applications as well.